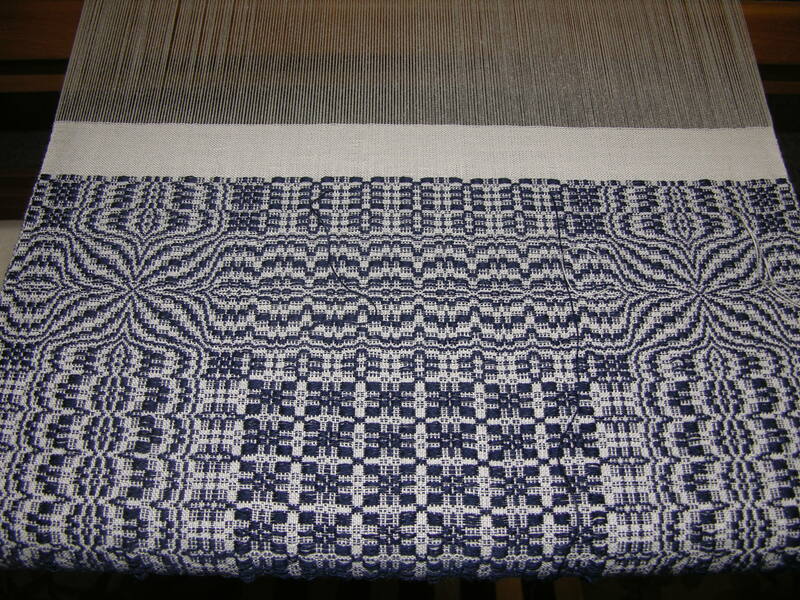 I have finally reached the end of the first runner for this warp, or maybe the end of the last, depending on how I feel. This has been the warp from hell for me. 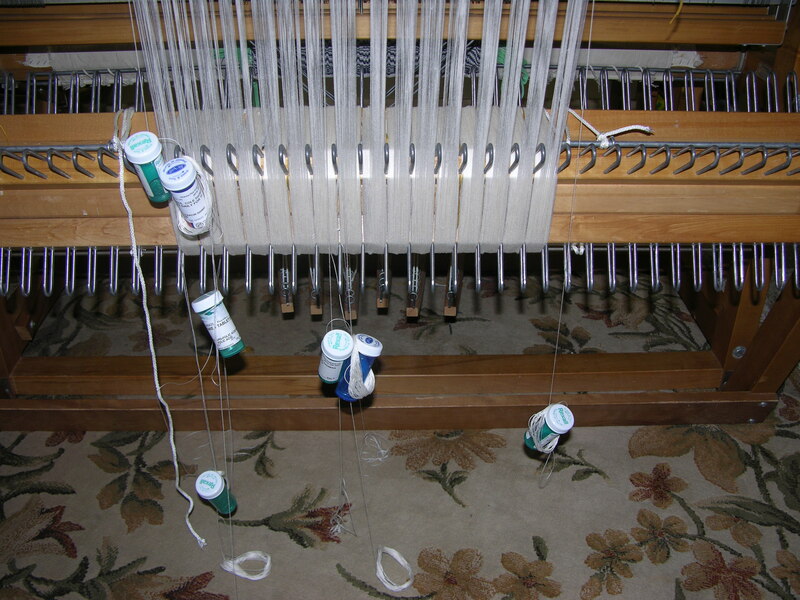 The spools themselves had knots, but the biggest annoyance has been warp threads breaking. I have searched on-line, started a discussion on Ravelry, and have spoken with more experienced weavers to determine the possible cause (me, loom, thread), but it is hard to come up with a clear answer. The breakages have occurred after I have advanced the warp and tensioned it. Could there be too much tension on the warp? Well maybe, but after comparing mine to others, my tension is not any tighter (and probably a bit looser) than those I compared it to. One thought I had was maybe the metal heddles were too rough for the 2/16 mercerized cotton I am using. However, that was met with a bit of skepticism from my weaving group, mercerized cotton is supposed to be stronger than unmercerized cotton (I was going to replace the metal heddles with Texsolv, but I will hold off on that for now). This is the first time I have used anything as fine as 2/16, but should that really make a difference other than it takes longer to weave 36″ in 2/16 versus 2/8? The majority of the broken threads are in one area. This warp consists of one entire spool of 2/16 mercerized cotton and part of a second. Selvedge threads were added after the warp was put on and came from the second spool, all of my repair threads have come from the second spool, and now one of those repair threads has broken. What does this all mean? Could it be a bad spool of cotton? Maybe. Other than the broken threads, I have enjoyed weaving with the 2/16 mercerized cotton. I love the sheen that the cotton has and the heirloom look it gives the runner. If anyone has any other ideas as to what my problem might be, I would love to hear from you. This entry was posted in weaving and tagged 2/16, cotton, mercerized, overshot, runner. Bookmark the permalink. I have no idea what the problem could be but the product is simply spectacular! I love that classic blue and white combo–just lovely. Thank you very much Kerry.